The Pt-C eutectic provide a reliable reference point for temperature sensors calibration at temperatures around 2000 K and is a very interesting system for metrology application. 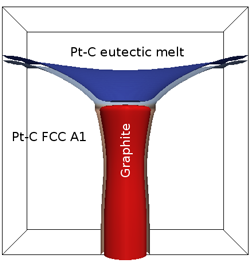 To fully understand the kinetics of the Pt-C eutectic phase transition we perform a set of phase-field simulations replicating the needle-like solidification structures as well as cooling/heating temperature curves. Further investigations include the dependence of the morphology on the applied cooling-rate and the influence of impurities on the transformation temperature and resulting microstructure.